Ideal for history enthusiasts, this private 3-hour tour takes you to three of Sesimbra’s ancient fortresses. Departing Lisbon, you’ll journey along Portugal’s winding coast to Sesimbra, a historic fishing village perched on jagged cliffs, and visit the medieval Castelo de Sesimbra. See, too, the Moorish Palmela Castle (Castelo de Palmela) and Castelo de Setubal, declared a national monument. Receive undivided attention from a private guide and relish the convenience of hotel pickup and drop-off in Lisbon or Cascais. Your private tour begins with pickup from your accommodation in either Lisbon or Cascais. Here, you’ll greet your guide and board an air-conditioned coach destined for Sesimbra, a charming fishing villages whose colorful houses tumble into the tranquil Sesimbra Bay below. Admire the medieval fortress, built by the first king of Portugal, Afonso Henriques, and absorb sweeping ocean vistas. Your next stop is Palmela Castle (Castelo de Palmela), an 8th-century Moorish fortress and beautifully preserved military stronghold, where your guide offers detailed historical information that dates back to the Neolithic period. 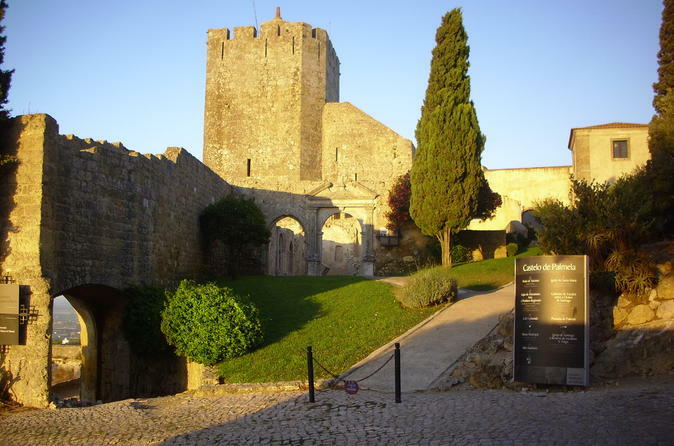 Finally, make your way to the Castelo de Setubal, whose surrounding walls were constructed by King Don Pedro I. Your tour concludes with drop-off at your hotel in either Lisbon or Cascais.